I first came across this fish in Carrefour in Elche, looking as if made of steel. It had a bream like appearance but I had no idea what it was and had to consult various books to find out. I learned that its English name is Ray's bream (although it is not a member of the sea bream family) and is named after the 17th century English naturalist John Ray, but I have never seen it in England. I had also seen a fish in Spain called Palometa blanca which is Spanish for Pompano (palomino or palomète in French). In Europe, Palometa blanca or pompano is sometimes called Asian or Mediterrranean pomfret. I haven’t tried it but I have read that the Mediterranean variety are not worth eating so I will probably not bother. To add to confusion, Ray's bream, Palometa negra, is known as pomfret in N America. 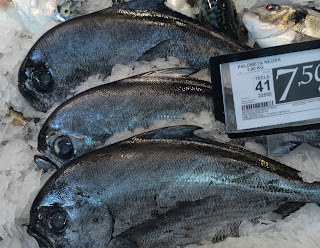 In some parts of Spain, Palometa negra may be known by its Catalan name, Castanyola and similarly castagna in Italy and castagnole In France, where it is sometimes called brème, but in south eastern Spain it is usually sold as Japuta. Once seen you cannot fail to recognise its distinctive steel-like appearance. In August 2015 they had some in Eroski in Santa Pola on offer at 4.95€ per kilo and as my son, Damien and family were staying with me I decided to give it a try. My Spanish is none too good and I thought the fishmonger was asking if I wanted it skinned. I said no, just cleaned, which normally includes scaling, so I was surprised when I got home to find that it had not been scaled. A subsequent effort by Damien and myself, both with scaling tools and the chef's knife proved difficult and only partially successful. The next time I bought it, in the summer of 2016, I specifically asked for it to be scaled - it was a Herculean task and not very well accomplished and required further effort on my part when I got it into the kitchen. The scales are as tough as steel and are all strongly linked. Recipe books suggest poaching or roasting whole or frying fillets. I have cooked it whole on two occasions poaching (2015) and roasting (2016) and have published the two methods on this blog.